Sparkle and Fade is the second album by Everclear, released on May 23, 1995. It was their first album to be released exclusively on Capitol Records; their previous effort, World of Noise, was re-released on Capitol after its introduction through the Portland, Oregon based label, Tim/Kerr Records. The album produced the singles "Heroin Girl," "Santa Monica," "Heartspark Dollarsign" and "You Make Me Feel Like a Whore". Ostensibly, the album's music follows themes like addiction and romance through a loosely defined narrative similar to Art Alexakis' own troubled life when he was in his twenties. The album's cover features childhood pictures of the three members of the band. It is Everclear's third-best-selling album to date. It climbed to the top of the Heatseekers Chart in January 1996 and was certified Platinum by the RIAA in May 1996. In 2016 independent vinyl reissue label Intervention Records reissued Sparkle & Fade on 180-gram vinyl. All songs written by Art Alexakis, Craig Montoya, and Greg Eklund, except as noted. ^ Erlewine, Stephen Thomas. "Sparkle & Fade – Everclear". AllMusic. Retrieved December 5, 2015. ^ Larkin, Colin (2011). The Encyclopedia of Popular Music (5th concise ed.). Omnibus Press. p. 1016. ISBN 0-85712-595-8. ^ Harris, Keith (2004). "Everclear". In Brackett, Nathan; Hoard, Christian (eds.). The New Rolling Stone Album Guide (4th ed.). Simon & Schuster. pp. 285–86. ISBN 0-7432-0169-8. ^ Christgau, Robert (November 14, 1995). "Consumer Guide". The Village Voice. Retrieved December 5, 2015. ^ Colburn, Randall (September 15, 2015). 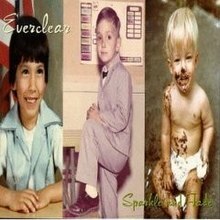 "On Sparkle And Fade, Everclear found universality in drug-addled intimacy". The A.V. Club. ^ Phalen, Tom (December 1, 1997). "Everclear, Electric And Acoustic, Shows Sparkle, No Fade". Seattle Times. Retrieved August 13, 2014. ^ Borzillo, Carrie (February 3, 1996). "Everclear Won't "Sparkle and Fade"". Billboard. Retrieved August 13, 2014. ^ "Gold & Platinum - RIAA". RIAA. Retrieved December 27, 2016. ^ "Sparkle and Fade – Intervention Records". www.interventionrecords.com. Retrieved March 20, 2018. This page was last edited on 21 December 2018, at 16:28 (UTC).